If you wanted an introduction to some of Shu Uemura’s most iconic products… look no further than the limited edition Iconic Discovery Set which comprises 3 of Shu’s most well-known offerings. After being sent the set for review consideration, I was extremely keen to find out if the infamous cleansing oil would live up to the hype that surrounds it. Infact, so keen was I… I went and took all my makeup off with it in the middle of the day. In the same way a 4yr old with no patience might. It’s a light-feeling oil that spreads easily over skin with no dragging as you massage it into the delicate eye area. The scent is extremely mild and totally pleasant… not at all oily-smelling like the DHC oil. It emulsifies nicely with warm water and rinses away leaving my skin completely free from makeup. Mascara melts happily between my fingers as I gently work the oil across my lashline. If you are going to use a cleansing oil to melt away mascara, then you need to GENTLY encourage the oil onto those lashes. I have used cleansing oils in the past that have left my eyes stinging or at the very least – cloudy. This is a total “no no” for me and thankfully the Shu Uemura Cleansing Oil left my eyes fully unaffected. I was hoping that the Shu Uemura High Performance Balancing Cleansing Oil would be the one that put an end to the ‘after cleansing tightness’ that is a significant cleansing oil annoyance for me. It didn’t. My skin was left a little tight as with most oils I’ve used… nothing that wasn’t remedied by a slick of moisturiser, but it means that (for me) Shu Uemura Cleansing Oils have been lifted down from their pedestal status. A great cleansing oil, but I’ve used ones that are just as good for 2/3 of the price. 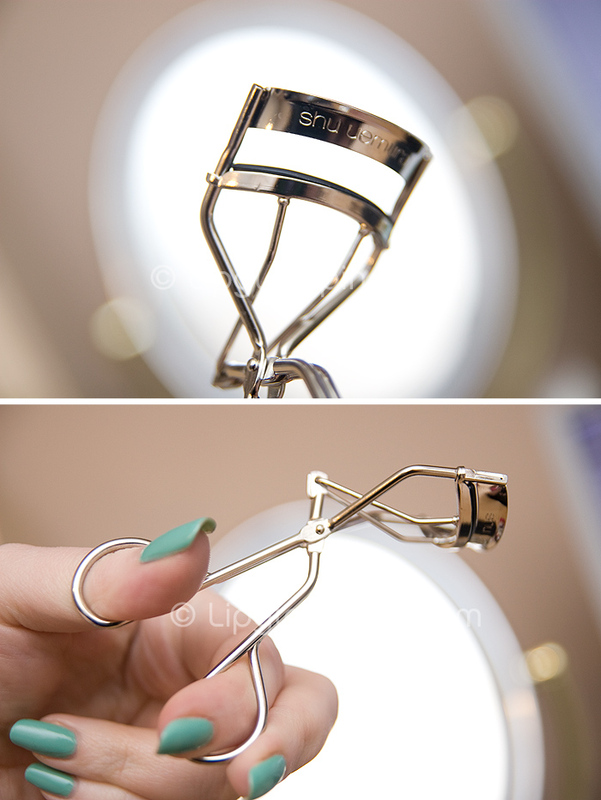 Ahhh, those “eyeconic” lash curlers! I’m blessed with naturally curly lashes, so curlers aren’t something I generally incorporate into my daily routine. At least, they weren’t until I tried these. I’d previously owned one pair of curlers, a set of ELF ones that I bought last year and struggled to make fit my eye socket… contorting my face and gurning as I angled my head this way and that trying to get all my lashes to squish into the business end. When I pulled these out, I was surprised by how light they felt. There’s a real delicate ‘springiness’ to them. I have to say, they fit my lashline perfectly… from those little lashes right in the inner corner around to the longer outer ones. I can also get right down into the base of my lashes with these Shu Uemura curlers. I can completely see why they’ve achieved the cult status that they enjoy. My lashes get enough natural lift at the base, but a little squeeze towards the tips with these curlers makes quite a difference to achieving a more doe-eyed flutter! I’m impressed. Beige it says on the can…. Beige. Beige is never good for me. As a pale chick, you get to know these words… “honey, beige, sand, caramel, fawn…” and seeing them written on the back of any kind of base product is enough to set the corners of your mouth into a downward direction. “Beige” (in this case) is actually more “Vanilla” to be frank. You can see in my swatches that it’s really quite pale. You give the can a shake (it has a noisy little metal ball bearing inside which makes this far more enjoyable than it sounds!) and squirt a walnut-sized amount onto your fingers. Spread between your digits and then straight over your face before the mousse evaporates. There’s a definite ashiness visible at first thanks to the SPF which is a touch off-putting to say the least… but after about 40 seconds the base turns completely invisible on my skin. I would insert a caveat here that if you’re darker-skinned it may not be quite so invisible… because lets face it, if it looks ashy on ME… anyone darker will really notice that greyness and it may not fade so well. Once the base has had about a minute to “fit” to my skin, I’m SO loving the effect. 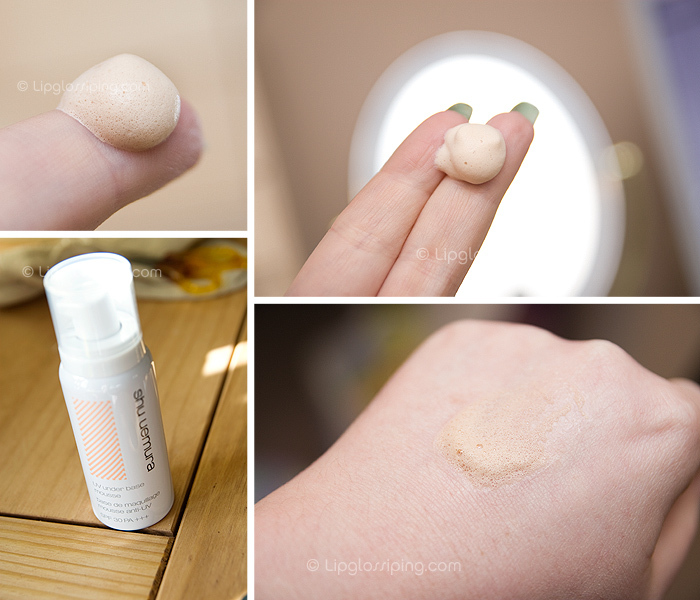 Again, as with all primers I’ve used… I’m not seeing any pore filling or wrinkle reducing stuff. But what I’m seeing on my skin-tone is a reduction in redness, a far matte-er appearance, a softer feeling complexion and thanks to the hint of colour, a more even overall tone. Throw into that mix a decent SPF30 sun protection and I would be more than happy to pop down the shops sans foundation. Another reason that I’m loving this product so much is… it’s easy. You don’t need brushes… it’s fun to use. Squirt and spread, squirt and spread. It dries to a powder matte finish in less than a minute. It’s a true no-fuss base. My one reservation with this product is that I think it would be too drying for me to use in the Winter. For the Summer, I will be squirting with reckless abandon… thrilled to have found something that leaves a long-lasting matte effect down the bridge of my nose! However, I have a couple of dry patches at the moment above my eyebrows and I don’t think that this base is doing them any favours. It’s something to consider if you’re a dry-skinned lady. If you’re more oily… I think this could be a fantastic product for you. So, 2 out of 3 ain’t bad (as they say). 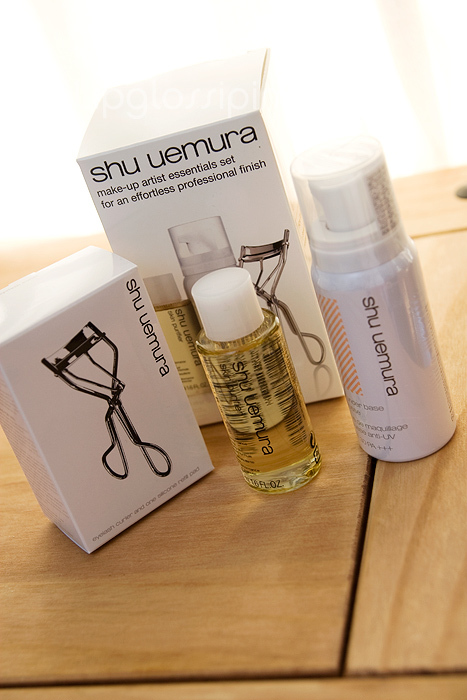 You can purchase the Shu Uemura Limited Edition Iconic Discovery Set from Beauty Expert. It’s priced at £41, which is a saving of £12.50 were you to buy the curlers and UV under base separately. Are you a fan of the Shu? 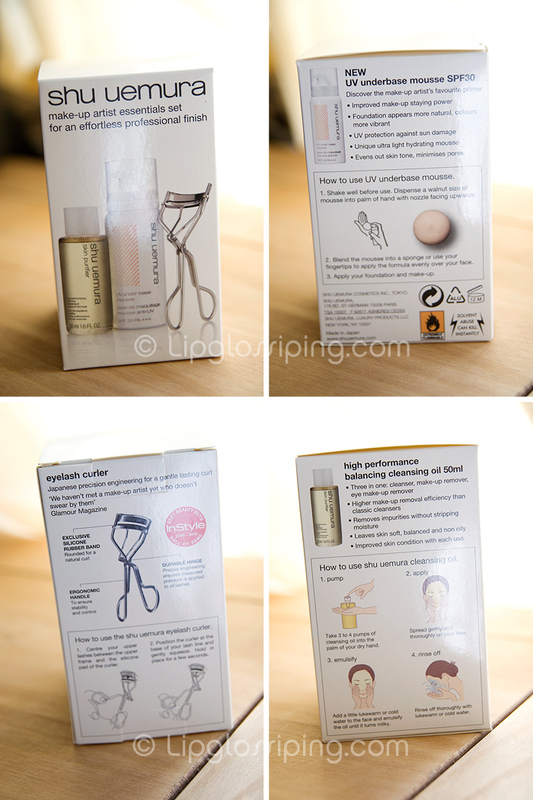 i really want to purchase this because i want the eyelash curler and try the cleansing oil. i’ve heard good things about cleansing oils and word on the street is that this is one of the best. As for the cleansing oil…yes, i use it especially when I’m so sleepy and just want to wipe all my make up off but pamper my face, too. I noticed though that I get a bit of an itch and a really minor rash if i use a different product on my face shortly after…almost like a civil war of ingredients on my face probably. I have really sensitive skin though, that’s just me. I’m tempted, really tempted. Just for the curlers. Oh why must you tempt me so?! thank you for doing yet another great post and for doing all this for us. I think I NEED to know what nail polish you have on… that is a gorgeous color! I am so tempted to purchase the mousse now. I think I am just in love with the idea of a shakey can and it being a mousse really. But something so easy to put on that is SPF 30 is great! That mousse primer looks fun XD though the ashiness is not cool. Also, I find it kind of amusing that these are Shu’s most popular and cult status products, but I’ve never seen the primer mentioned before this came out!